Self Care is participating in any activity that promotes happiness, feelings of peace, relaxation and healing. It is important to practice Self Care daily to maintain wellness and balance for the mind, body, emotions and spirit. Being a mom and a full time nurse keeps me on a unique, ever-changing schedule, so I have developed 5 Simple Self Care Techniques that I can practice anywhere, anytime to restore balance within an unbalanced schedule. Practice one or all of these techniques daily, as often as needed, to restore and maintain balance. 1. Breathe. Take 5 minutes, or as often as needed, to focus on your breath. It is true we breathe automatically, however we often take in just enough oxygen to get us through to the next breath. We tend to hold our breath when we are stressed, anxious, upset or even concentrating too hard. Take a moment to focus on your breathing and enjoy taking deep, cleansing breaths to nourish your brain, heart and organs. Breath out tension, stress and judgments. Notice your awareness to each breath as you fill your lungs from top to bottom. While breathing in, allow the belly to fill and while breathing out allow the belly to fall. Relax and allow your natural breath to create balance from the inside out. 2. Enjoy Nature. Take a 5 to 30 minute break and go outside, sit on the grass at the nearest park, walk around fountain at the office, put your feet in the sand or hug tree. The Earth’s vibration frequency is 8-10 Hz which is identical to the frequency of alpha brain waves in our brain. Connecting with nature naturally stimulates your brain to produce relaxing alpha waves. Being in an alpha state gives us a sense of well-being and balance. However you can, get into nature and enjoy some nourishing fresh air, warming sunlight and relaxing Earth vibes. 3. Get toned. Use sound vibration to positively effect your organs, tissues and cells. By saying the tone of each vowel, you create a vibration that resonates in a different part of your body thus promoting balance. Say the vowels one at time and feel in your body where they vibrate. Place your hands over your heart as you tone “Ah” and then over your ears and head as you tone “Eee.” Hold your hands over your belly as you tone “Ohh” and feel your organs restore balance. Practice this technique while in the kitchen, stopped in rush hour traffic, while in the shower or on your lunch break, anywhere as often as you need. 4. Inhale. Inhaling pure, therapeutic-grade essential oils (such as dōTERRA ) can quickly raise the frequency of the human body, restoring it to it’s normal, healthy level. Essential oils were mankind’s first medicine and have been in use for thousands of years, restoring balance to the body. Lavender is my go to oil as it is especially useful for promoting peace and calm. Pick your favorite essential oil, place 1 or 2 drops on a cotton ball and take it with you to inhale when ever you need. 5. Be Positive. Positive affirmations are statements you say to yourself to counteract negative thoughts and beliefs. 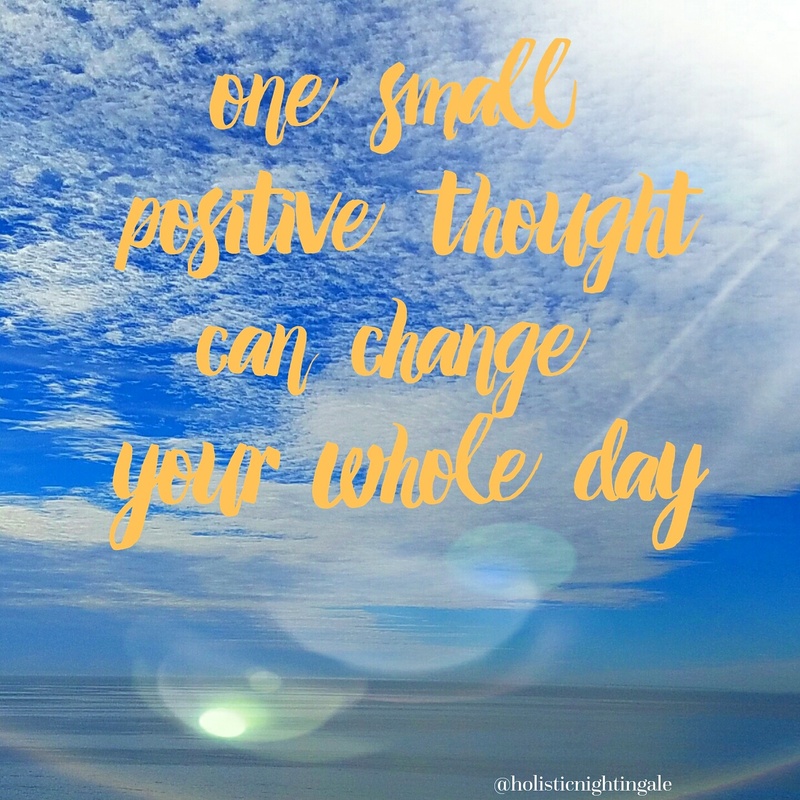 When we make a conscious effort to change our lives, positive affirmations feed us invigorating, positive energy creating a sense of well-being and balance. When I start to feel anxious or overwhelmed, I stop and say a few positive affirmations to myself to lift my mood, change my attitude or feel balanced in the midst of chaos. Simple affirmations are things like: I am calm. My healing is in progress. I am at peace. I am happy being me. I am balanced. Maintaining balance within your life, whether it you’re a nurse or not, is essential to health and healing. What simple techniques do you practice to promote balance within your life? Add them here in the comments!